Outrage over the arrest of two black men at a Philadelphia Starbucks continued on the evening of April 16. The two men had been arrested on April 12 at the 1801 Spruce St. Starbucks after a manager asked them to leave because they had not purchased anything (the men were waiting to meet an acquaintance). The manager called the police, who arrested the men after they refused to leave. The men were later released after Starbucks refused to press charges. Protests occurred outside of the Starbucks over the weekend and on Monday morning. 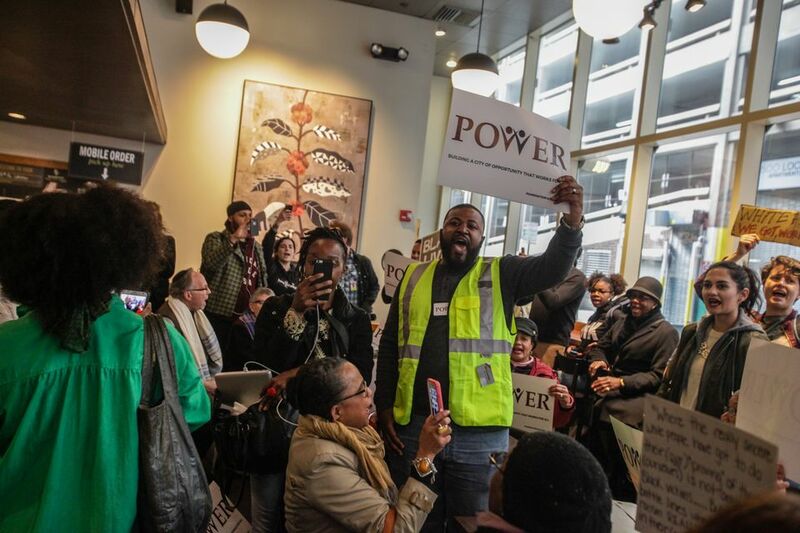 The evening protest on April 16 was organized by Philadelphians Organized to Witness, Empower and Rebuild (P.O.W.E.R), an interfaith community organization made up of clergy and community members. P.O.W.E.R had its groups sit-in at the Spruce St. location. You can see highlights of that part of the protest in the video below (to see the full hour-long Facebook Live broadcast of the protest click here). After the sit-in, the protesters moved on to the Starbucks location at 15th and Latimer, which they entered and reiterated their demands. A meeting with Starbucks leadership to discuss the coffee company’s role in gentrification and perpetuating racism, policies regarding customers and investment in black-owned franchises in African American communities. They also want a minimum $15 an hour wage for Starbucks employees. A meeting with the Philadelphia Police Department leadership to discuss implicit bias training, de-escalation techniques and the use of body cameras. They also want all police officers to wear body cameras within a year. The protesters were stopped by police from entering the Starbucks location at the Bellevue building at Broad and Walnut streets. Instead they gathered at the building’s steps and continued their protest. The protest concluded around 5:45 p.m., although the group stated that there would be more organized protests in the future. To learn more about P.O.W.E.R. go to powerinterfaith.org.